These all ALL the wrong cartridges...can I send them back and get them replaced? CONS: These all ALL the wrong cartridges...can I send them back and get them replaced? Junk. Ordered it Sept. 16. Arrived Sept. 19. Worked until October 16. Won't print now. I've ordered and been using the other colors from Monoprice before. All were fine. The Black though is not. I'd like a refund please. I've not even had the item 30 days. CONS: Worked less than 30 days. Thank you for your review. And I am truly sorry to hear of your experience you have had with this product. For now, if you prefer, I can assist you in setting you up for a replacement on the item if you haven't done so already. We do have a lifetime warranty on cables as well as a 1 year warranty for everything else. It will be of no additional cost to obtain a replacement, so please let me know if you want to continue. Thank you! I have had to Clean the Printheads twice now in order to print a single letter. 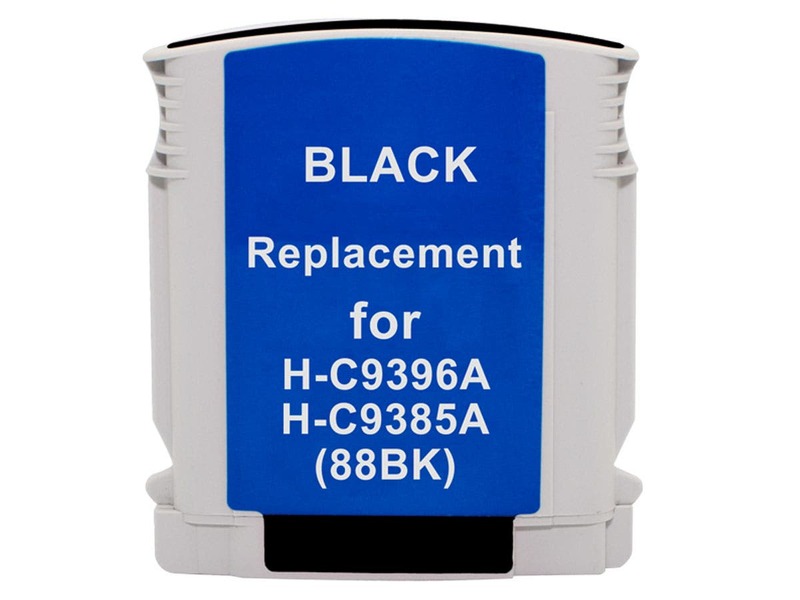 Although the black ink cartridge is less expensive than Factory, The cost saving is used up with all of the printhead cleaning. This was my first Monoprice printer cartridge purchase, and based on this experience it will be my last. I was eager to try the Monoprice cartridge because the price is so much lower than HP-branded cartridges, so I purchased black, cyan and yellow Monoprice replacement cartridges. My HP-branded black cartridge was nearly empty when I placed the order, so I was able to start using the black cartridge soon after I received it. Unfortunately, the unit I received began each day virtually unable to print anything. After a couple cycles of the "Clean Printhead" routine on the printer and printing a few pages with streaks where nothing was printed, it could produce respectable print. If the printer was idle for a few hours, though, I had to repeat the "Clean Printhead, print a few pages" process. After a week or so of this, I contacted Monoprice, whose agent told me that while my experience was unusual it did happen from time to time. He was good enough to ship me a new unit free of charge, without an obligation on my part to return the old one. I appreciated the low-hassle replacement process, which is the only reason this product is getting a rating better than a "1." While the replacement process was low-hassle, unfortunately the replacement didn't work any better the first cartridge I'd purchased. If anything, it is worse. Now, instead of merely having to run the "Clean Printhead" routine and print a few pointless pages in order to get a quality page, there are globs of black ink on the left margin of every page, making this completely useless for professional purposes. I finally gave up yesterday and spent $150 on new "Genuine HP" cartridges for every color, fearing that the other cartridges I'd purchased would be just as bad. This was a very disappointing first experience with Monoprice. I will be very cautious about further purchases. I bought the Monoprice-branded replacement cartridges because I had heard good things about Monoprice products and the price was right. Unfortunately, I struck a poor bargain. These cartridges require me to run the "Clean Printhead" function multiple times a day, just to prevent streaks across the page where no ink is deposited on the paper. Further, the cartridge leaves blobs of ink on the left margin of the paper, making any kind of professional use impossible. When I had problems with the streakiness of the print with the first cartridge, I contacted Monoprice. The representative I spoke to admitted that while that problem was uncommon, it did happen from time to time. They were good enough to send me a replacement cartridge free of charge, for which I was gratefulgrateful until I inserted it into my OfficeJet and ran into the same problems. The only reason this product gets a "2" instead of a "1" is because Monoprice sent me a replacement for the first cartridge, even if the replacement didn't work any better. Don't buy this product I know I won't buy another one! Didn't fit printer it was promised to fit! I'm a fan of monoprice because of the awesome prices and great quality of the products, but shipping to Canada, while better than it used to be, is still quite high. I recently placed a similar-sized order of some similar products from a site in Hong Kong - with monoprice, the shipping was $30, but the shipping from the Hong Kong site was less than $5! Sure, it took 2 weeks to get here, but if I'm not in a hurry for stuff, I'd rather save the money.